Customer service skills are extremely important for those hoping to become successful dog groomers. While you do spend the majority of time with the dogs, you have to be able to communicate clearly with each owner to determine exactly what cut they want for their dog. You also have to make the client feel valued and appreciated each time they visit your salon, much as a human hairstylist would. It's important to demonstrate that their dog will be safe in your hands by reassuring the owner and showing respect for their pet. A large part of the job is interacting with the dog’s owner and ensuring that they are satisfied. Happy customers will lead to referrals and positive reviews, which can help the groomer expand their business into a more profitable venture. Many breed specific cuts involve quite a bit of technical skill, and they can be tricky to execute properly. A groomer must be able to wield a variety of grooming implements safely and effectively to achieve the desired results. This requires a great deal of dexterity and good eye to hand coordination. Some cuts can take quite a long time to complete, and some dogs may be reluctant to cooperate when placed upon the grooming table. Groomers must be patient and persistent throughout the entire process, giving the dog a brief break if it becomes necessary to do so. Getting frustrated with the dog will not help the situation, and the dog may react even more negatively if it senses the groomer’s growing impatience. Groomers must have a good knowledge of canine behavior and how to manage dogs with various behavioral issues. They must take care to work around the dogs in as safe a manner as possible, since dogs may act up when in unfamiliar surroundings or after being subjected to long periods of standing skill on the grooming table. Some dogs may be prone to unexpected biting or nipping, so the groomer must have knowledge of body behavior to identify whether a dog is in pain, scared or about to misbehave. Many cuts require extremely careful scissor work, layering, and artistic talent. Groomers must be able to execute cuts precisely and in accordance with the standards for each breed. Groomers can sharpen their skills by completing various professional certification programs, working with show dogs, or interning with an experienced grooming professional. It's important to understand the various techniques of cutting the types of hair of different breeds. There is no substitute for hands-on experience, and the more dogs a groomer has the opportunity to work on the better they will become. 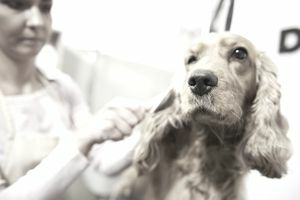 As a part of their grooming process, groomers check each dog for any readily visible signs of health issues (including parasites, skin irritation, or other apparent infections). General knowledge of common health problems is essential to doing this job well. The groomer is responsible for reporting back to the owner if they discover any issues that might be best addressed by a visit to the veterinarian. Knowledge of canine anatomy is also beneficial, as specific cuts must be made at designated anatomical points to be executed correctly. Grooming is a business and must be treated as such. Solid business skills are particularly important if the groomer is operating as an independent contractor or runs their own salon location. The groomer should have some skill with scheduling, managing expenses, purchasing supplies, and basic accounting work. They should also know how to market and promote their services effectively.